The Ministry submission came in response to a series of petitions which are pending before the apex court calling the MCI guidelines arbitrary, discriminatory and also standing in violation of the Disabilities Act. Act and whether it intends to accept the report of the Committee formed by the MCI or not. The court had also left it open to stakeholders for disabled categories including the petitioners to submit a representation to Central Government. Recently, over 75 doctors under the body” Doctors With Disability – Agents of Change” including Dr Satendra Singh, member Ethics Committee of Delhi Medical Council, submitted their representation with the central government rejecting the said guidelines. The representation was critical of the Report submitted by MCI and cited instances of individual doctors who have excelled in their disciplines inspite of the disabilities which would otherwise have been not allowed by MCI. 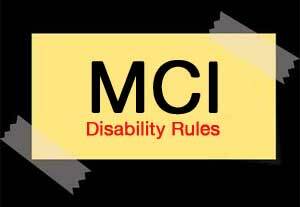 They had requested for MCI to reframe the guidelines in accordance with best global norms and in consultation with organizations working in the field of disabilities. The points raised in the representation included locomotor Disability, dyslexia and other disabilities. The group includes other disabilities besides the 5 specified disabilities of Leprosy cured person, Cerebral palsy, Dwarfism, Muscular Dystrophy and Acid attack victims. Persons with disability below 40% will not be eligible for PH quota. Persons with disability between 40-80% will be allowed to pursue medical education with PH quota. Persons with more than 80% disability may also be allowed: but after their selection, their functional competency will be determined with the aid of assistive devices. The inter-se prioritization of disability bands of 10% each within the 40-80% range is not practical. The entire group of 40-80% range may be uniformly made eligible for PH reservation and the ranking of the candidates can be as per NEET merit. Persons with disability of 40% or more will not be allowed to pursue medical education. However, it is noted that the extent of disability in case of visual impairment is after the best correction. The stakeholder expressed that persons with disability in the range of 40-­60% should also be allowed. However, the expert opinion was unanimous that in the interest of patient safety, it may not be advisable. Such students will not be able to pursue medical education and practice medicine. The view of experts was agreed to by all. The issue of color blindness was also discussed. Though it is not a specified disability but it was agreed that it also needs to be examined in future to determine the suitability of such candidates. Persons with disability of 40% or more may be allowed to pursue medical education if the extent of disability can be brought down to below 40% with the aid of assistive devices. The participants in the meeting disagreed with the finding contained in the Report that there is no method of quantifying the extent of disability in specific learning disability. The stakeholders could produce before the Committee specific learning disability certificates issued by AIIMS, New Delhi and some other Institutions. They appear to have determined the extent of disability based on the guidelines notified by MoSJ&E vide notification dated 05.01.2018. The stakeholders apprised that persons with specific learning disability are getting benefits including in jobs in other areas and depriving them from medical education by not extending the PH quota benefit would be unfair. It was decided that persons with disability of 40% or more will be allowed to pursue medical education with PH quota. No upper limit needs to be prescribed as the candidate even with such extent of disability would have qualified NEEL Those with disability of less than 40% would not be entitled to PH quota benefit. The participants did not agree to the segregation of the 40-80% range in two group as proposed in the Report. It decided that the entire group of 40-80% range may be uniformly made eligible for PH reservation and the ranking of the candidates can be as per NEET merit. Persons with disability below 40% will not be eligible for P1-1 quota. The participants did not agree to the segregation of the 40-80% range in two groups as proposed in the Report. It decided that the entire group of 40-80% range may be uniformly made eligible for PH reservation and the ranking of the candidates can be as per NEET merit. Multiple Disabilities- The combining formula as recommended in the Report for computing the disability arising when more than one disabling condition is present in an individual was endorsed in the meeting. Upper limbs disorder allowed or not in Neèt new rule.